A compilation of all the things we've learned during 15 years of managing rabbit colonies. When we started with rabbits, we took the conventional route of housing them in standard, conventional wire cages. After only a year or two of that approach, we became interested in raising rabbits in more natural social groupings, an approach that has become known as colonies. We started off as many do, with a small pen housing a small group of rabbits - a male and several females. Then the lessons began. We started to encounter issues with the social hierarchy, rabbit dominance and rabbit fighting. We had uncontrolled breeding, and lost track of which buck had sired which litter. We had some infectious diseases move through the groups, and we had more than a few rabbit escape adventures. After each escapade, we reviewed what had happened, what we wanted to change, how best to change it, and then we'd try again. At the same time, we started experimenting with putting rabbits on grass. Sometimes it was normal lawn grass, sometimes it was pasture. Sometimes it was a planted bed in the garden. We had some really good successes, we had some dismal failures, and we had a lot of mixed results. As with the colony management approach, we always tried to review our results, figured out where we'd gotten off track, and worked to improve our methods. As we worked with these two approaches, usually simultaneously, we started getting questions from other rabbit owners about how we were doing things. Sometimes the questions were fairly general: could pastures replace some or all of the rabbits' diet? Were we still getting decent reproductive rates? Did we see an increase in disease issues? Other times the questions were extremely specific: what size wire did we use for the top, sides and floors of our pens? How much supplemental lighting did we need to supply in winter to maintain reproduction? Did we feed hay, and if so, what kind? After awhile, we realized we were getting the same kinds of questions, over and over again. While we certainly enjoyed visiting with rabbit owners, we wanted to find a way to reach a wider audience, so that folks didn't have to repeat all our mistakes and re-learn what we'd already learned. At that moment, the concept for this latest publication was born. Section 6 is a Photo Gallery of our operation over the years, showing a variety of different pen designs, with notes about how well those design features worked (or didn't work). People who want to keep rabbits in natural social groupings, but have questions or concerns about how best to manage them. Folks who already have colony rabbit groups and would like to review additional methods, materials, techniques and approaches. Individuals who want to diversify their rabbits' nutritional program, particularly in terms of adding pasture, grass, hay, and/or fruits and vegetables. Individuals who must comply with local regulations, zoning or neighborhood covenant rules and must choose a pen that will meet those requirements. Mentors for ag-related youth clubs such as 4H and FFA, and want a comprehensive guide to help students/participants design and build colony rabbit pens which will function well. Teachers who are covering small scale rabbit production in the classroom. Local or state regulators who are tasked with updating regulatory code for small scale rabbit ownership within their jurisdictions, and need a guide for best-practices housing, waste management, disease control, and pest control. The PDF format is 68 pages long, 8.5" x 11" size, full color, with a detailed Table Of Contents. The PDF file will be available for instant download as soon as payment is confirmed via Paypal. Note: After you have received confirmation from Paypal that your payment has been successful, you will see a hyperlink on the Paypal page for "Return To Frog Chorus Farm". Click that link to go to the instant download page. If you leave the Paypal page without clicking that link, please Contact Us so that we can send you the link manually. That followup may take up to 3 full business days. 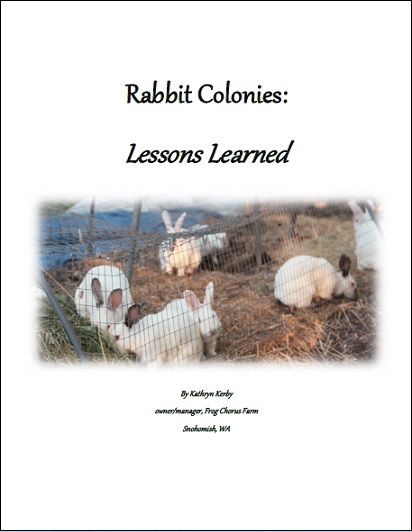 We sincerely hope that new and experienced rabbit owners will find answers to all their colony questions within this publication. We hope that they share with us their colony pen designs, and how well those designs worked for them.